The Powerball’s rollover streak continues following last Saturday night’s draw. There were no jackpot winners during last Saturday night’s draw, which means that the $145 million jackpot will rollover to a sizeable $165 million prize pot with a cash option of $99.7 million. As for secondary wins, there were also no winners of the $1 million second prize. There were many who matched less than 5 numbers though. For instance, 15 won the third prize, while 465 won the fourth prize. Overall, there were 723,529 players who won at least $4 each. For the last three years, a group of 10 Ethan Allen employees has been religiously playing the Powerball every week, with each member pitching in $10. 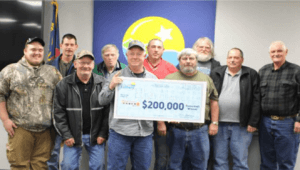 During the January 20, 2018 draw, the group’s effort finally paid off big. They recently cashed in a $200,000 prize and took home $14,100 each after taxes. Had the group not activated the Power Play, they would have gone home with a $50,000 prize instead. Thanks to the 4x multiplier, however, their prize quadrupled to $200,000. It was truly their lucky day! The group—which consists of Anthony Rowe, Eric Dellinger, Dale Hedrick, Dennis Seltzer Jr., Johnny Moss, Matthew Hedrick, Randy Heavner, Randy Jones, Roger Smith, and Ronald Lute—plans to keep playing until they match one more number. Just like the US Powerball, the Mega Millions jackpot continues its weeks-long rollover streak. 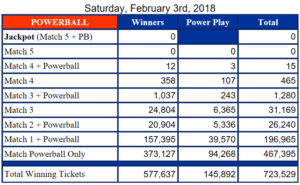 During the February 2 draw, there were no winners of the $104 million grand prize which means that the jackpot will rollover to $120 million come Tuesday, February 06. Winners will be offered a cash option worth $71 million. As for secondary wins, there was one winner of the $1 million second-tier prize while there 33 winners of the third prize. Overall, there were 252,005 players who won at least $4 each. The search for the mystery owner of a $1 million Mega Millions ticket last August 8 of last year just ended yesterday, February 4. The ticket was purchased at Summit Food Store on 1900 Highway 18 in West Point, Georgia. The winning numbers from the draw were: 11-17-50-52-74, Mega Ball: 14. If you are the owner of the ticket, take note that you won’t be able to claim your prize anymore. Remember, you only have a total of 180 days from the date of the draw before winning tickets expire! Just like the other big lotteries, Euromillions also rolled over following the February 2 draw. What was supposed to be a €108.7 million jackpot will now become an estimated €116 million for this Tuesday’s draw. While there weren’t any grand prize winners, there were many who won secondary prizes. 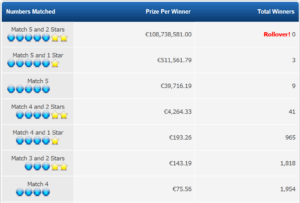 For starters, three lucky players won €511,561.79 each for matching all five numbers and one Lucky Star. Nine won the nearly €40,000 third prize, while forty-one players won €4,624.33 each for matching four numbers and two Lucky Stars. Overall there were 2,363,020 winners.